Following the successful launch of the James C. Seminaroti Benefit Golf Outing in 2017, the second annual event – held Friday, Sept. 21 at the Fox Den Golf Course in Stow – built upon its success by bringing in $800 to support the fight against amyotrophic lateral sclerosis (ALS). 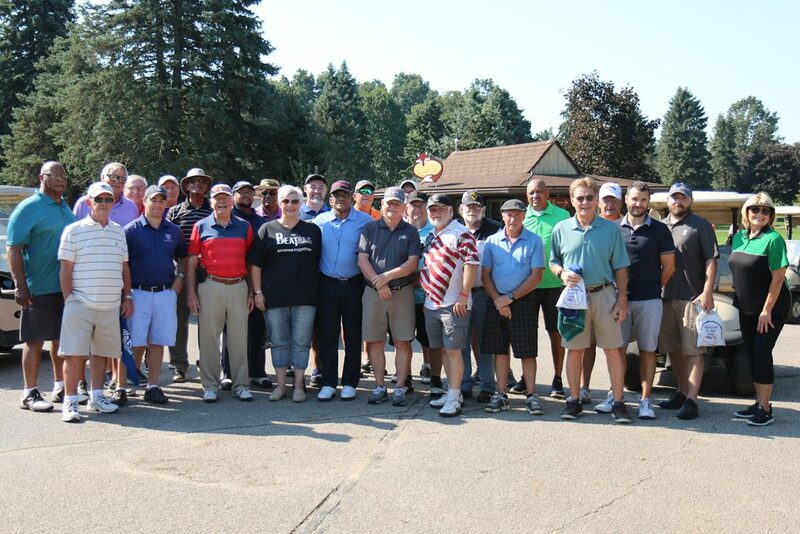 All proceeds from the event were donated to the ALS Association Northern Ohio Chapter. This year’s event, hosted jointly by the VSC and American Legion Post 473, drew 32 attendees including members of local veteran organizations and VSC agencies from neighboring counties. Participants included Dennis Gutowski, former executive director of the VSC of Summit County, and Rich McClellan, director of the VSC of Portage County. Also in attendance was Pete Seminaroti, James Seminaroti’s son. Research has shown that veterans from any branch – even those who have served during a time of peace – are at a much higher risk than the general population for developing ALS, a rapidly developing neuromuscular disease that affects thousands of people throughout the U.S.
An Akron native and World War II veteran, James Seminaroti was actively involved in numerous local veteran organizations, becoming a founder of Fred W. Reese Veterans of Foreign Wars (VFW) post 3310 in Akron and contributing to the American Legion, the Salvation Army and the Military Order of the Cootie of the United States. As a member of The Salvation Army’s Akron advisory board for more than 15 years, he organized a program called Operation Concern that aimed to make soldiers’ send-offs more pleasant by providing breakfast and free necessity kits. Seminaroti died Nov. 4, 1981 following his own battle with ALS. His legacy of service lives on in the VSC’s annual Veteran of the Year Award, presented each fall to a Summit County veteran who displays selflessness through service. If you want to donate to the ALS Association Northern Ohio Chapter, visit webnoh.alsa.org.